In this chapter we completely disassemble the C4 front suspension to its individual components. The C4 Corvette was in production from 1984 to 1996, and improvements were made throughout the production run. My donor car for the front suspension and steering is a 1996 Corvette Grand Sport. But this chapter will help you no matter what year C4 you may have. This chapter begins by giving background on my front-end purchase. 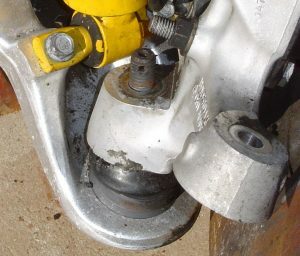 Then the components of the suspension & steering are identified for you through detailed photos and pointers. The tools you need are then listed, and they are also extensively illustrated throughout the chapter as they are used. Finally, I show you the safest method to secure the front-end to begin the disassembly process. Each step contains photos with pointers for easy reading and clear instruction. Chapter 3 takes you through 17 detailed steps to safely remove each component of your C4 front-end. My donor was off the car since it was purchased from a salvage yard, but the steps are the same if this assembly is part of a whole car. 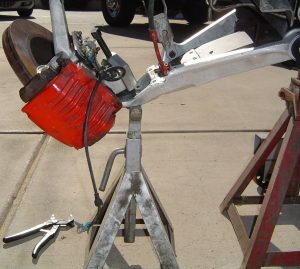 There are 41 photos with illustrative pointers to show the do’s and don’ts of disassembly. Each procedure names the best tool to use and how to use it correctly. After a procedure is completed, I show you the best way to clean and store the retained parts. Particularly important is the removal of the transverse leaf spring. Unlike most cars that have coil springs, the C4 Corvette uses the more reliable and responsive leaf spring. The energy stored in this leaf spring is tremendous and removing it without knowing exactly what to do can be dangerous! The procedure to remove it is worth the price of this chapter alone. 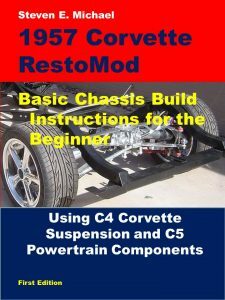 All beginners have to start somewhere, and my book speaks directly to the novice hot-rodder of Corvettes.